A residential staff appraiser has filed an overtime class action lawsuit against appraisal management company CoreLogic Valuation Solutions. The appraiser is a current employee and works as a staff appraiser in Southern California. 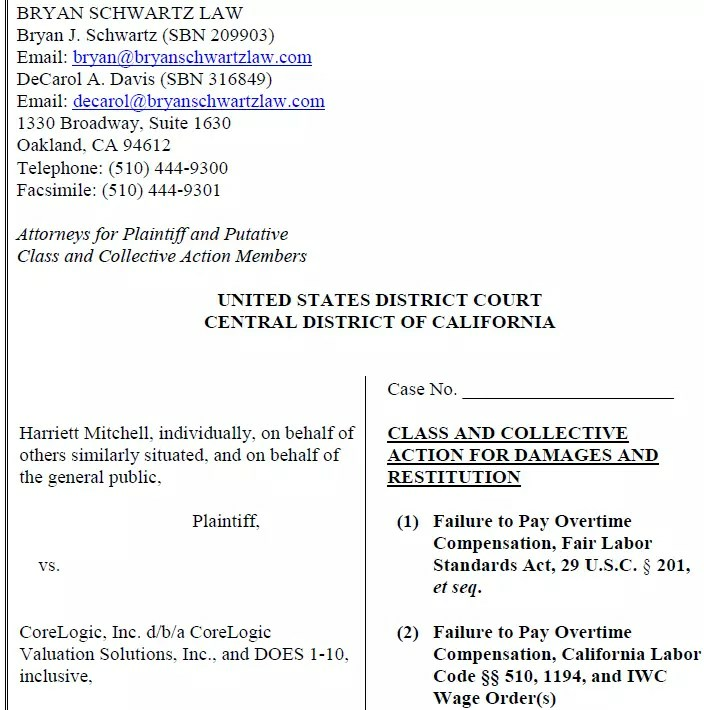 On behalf of herself and a putative class of similar CoreLogic staff appraisers, she alleges that CoreLogic’s compensation practices violate the overtime pay requirements of the federal Fair Labor Standards Act and California state labor laws. The case will be legally interesting to watch because CoreLogic allegedly pays its employee appraisers on a “piece work” per appraisal basis with additional compensation for based on production and other factors. The plaintiff alleges that she and other staff appraisers worked an average 5 to 20 hours of overtime per week above the regular 40 hours, but that their compensation for the overtime hours did not properly include the “bonus pay” in calculating overtime compensation. Under the law, the overtime rate of pay must be 1.5x the overall regular hourly rate, even when the employee is paid on a piece work basis. Many appraisal firms pay their staff employee appraisers per appraisal and it will relevant for such firms to follow this case. The lead attorney behind the case – Bryan Schwartz – is the same attorney who led a successful staff appraiser overtime class action against LandSafe Appraisal that resulted in a $36 million settlement in May 2015. Later that same year, CoreLogic purchased LandSafe from Bank America for a reported $70 million. As a general matter, overtime cases filed by employee appraisers continue to affect many large appraisal firms, as well as lenders who employ staff production appraisers or reviewers. The attorney leading the new CoreLogic case also has filed staff appraiser overtime suits against JP Morgan Chase, BBT and Solidifi. Last year, other attorneys based in Texas solicited appraisers to pursue overtime cases with a mass mailing. hose attorneys then filed two overtime cases — one against TSI Appraisal and the other against a smaller firm in California. Here is that 2013 post: “Overtime Lawsuits Affecting Appraisal Firms, Lenders and AMCs.” Five years later, appraisal firms, lenders and AMCs have now collectively paid more than $50 million in unpaid overtime, together with penalties, interest and attorneys fees. What about the independents? I have not had a standard 40 in as long as I can remember. If I would have sold out my independence and worked for an amc I could sue? They all behave that way! On a brighter note, if these companies were not able to pressure staff appraisers, the independent side would have a lot more negotiation room. Why is the Case # BLANK? The case no. is blank in the complaint document because at the time a court complaint is filed, the case number is not yet known by the attorney filing the complaint. It usually gets stamped or written somewhere on the complaint manually. I’ve been involved in other Federal cases with Judge Carter as the presiding judge. He is no nonsense, has an excellent reputation, and is well respected by the legal community. Please provide case # when it is known. My prediction: this case will be settled among plaintiff and defendant before trial – to keep the facts and testimony sealed and to avoid public scrutiny, among other reasons. Please keep us apprised as case progresses. Thanks Peter. Hi Craig, the case number is 8:17-cv-02274-DOC-DFM. Who would have thought being treated as non professionals would ever be to our benefit? Virtually every single argument in favor of FNMAs CU; or “Leveraged Big Data” or hybrids and alternative AVM based appraisal only adds ammunition to the plaintiff’s case. Every single argument that claims automation can do what we do augments their claim of ‘routinized’ non professional work products. Well done CoreLogic! – you mindless buffoons! Meanwhile, the appraisers who followed ‘professional advisement’ and did not work with amc’s fell on their own swords, and the most incompetent appraisers whom had no other options but to work with amc’s will be rewarded. For a long time I was down on ‘retired appraiser’, but now a days, I really miss that guys regular presence on the blogs. Turns out his cynicism was not just well deserved, but a necessary understanding point regarding just how imbalanced this industry has become. Save us retired appraiser, we need you now! Let’s face facts, overtime compensation is not even a drop in the bucket, mortgage origination appraisers nationally will be wiped out in less than a decade if these abusive trends continue. He still posts Baggs – with more specificity lately. Re suit, I think CL would likely try to settle but doubtful it would be sealed. I think they’d want that but in the end the only thing to be sealed is what the whole case is about – employees or exempt? Any settlement with any pay out pretty well defeats any reason for sealing the record. CL is a billion to billion and a half a year megalith. Ten million; twenty or even a hundred million is chump change to them. I wonder if the old DataQuick non compete clause had a sunset provision or whether it was a forever thing? It would be nice to have their old style basic services again. More and more will learn, Core Logic is bad business. Not IRES MLS in Northern areas Colorado. They’re merging with Corelogic Matrix Denver, creating another monopoly market for Corelogic to exploit. This just in, fresh off the press. Alamode sells to Corelogic. So what’s a reasonable alternative? Who owns ACI? Somehow I feel like there is this one monopoly company controlling everything. They’ve taken over my cost book, multiple local mls systems, and now my software? Corelogic is simply ruining the valuation industry one acquirement at a time. It’s time to break them up under anti trust. Everyone at AlaMode should be ashamed, what a stab in the back for both Mercury and Alamode to both end up in the hands of Corelogic. Best alternative Im aware of is Bradford ClickForms. Its not perfect but I have several friends that like it better than ACI or alamode. Lets hear from other appraisers across the country! What do YOU use? Does it also have UCIAR EP/SP or other commercial forms? Does it have 71A and 71B? There are 40,000+- unique appraiser sending reports to FNMA DONT use alamode anymore (as soon as your subscription run out). Start downloading all your cloud stored reports asap. Otherwise you will be a CL hostage forever. Yet another reason to refuse to use cloud based appraisal software! Corelogic, er, I meant alamode just hinted at bundled all in one approaches on the qa I posted below. So soon it will go public, have stocks, amazing price jack ups, and you won’t be able to tell the difference between subscribing to mls and appraisal software, who knows but it will be all bad if Corelogic is in charge of it. Get ready for technical delays with a never ending stream of unnecessary updates which work against the appraisers best interest. Now we see the big picture why daddy biggers shut down Appraisal Advisor. My Predictions: Most likely, this case will be settled quietly with an out of court settlement. This case probably will never see the inside of a court room other than for initial proceedings and pleadings, and, for the Judge’s final confirmation that the agreement (secret, not published) is approved by both sides. Many large corporations do not want facts and truth to become public domain via publication. One method is to wear down the Plaintiff(s), perform the depositions, determine the strengths and weaknesses of both sides, gather facts, hire consultants and experts, and so on, in order to reduce the eventual $$payout$$ to an acceptable level, along with very important words in the agreement like “accepting no guilt” of accusations and claims made. Some might call this simply a cost of doing business. I used A La Mode myself for a number of years. I have also used ACI and a couple others and have tested multiple software over the years. Presently, I use Bradford Technologies. I prefer Bradford over ACI and A La Mode. Each user has their own preferences of software for one reason or another. Some say ACI is great and others say A La Mode is great. Usually its the one they started with and don’t want to change. Bradford is an excellent option to consider if you want to show your support for the smaller company over the monopoly. They are located in Silicone Valley and are typically on the leading edge of technology. The learning curve is quite fast. Good tech support. Generally good software, photo program, mapping, integration etc. No software is perfect. Jeff Bradford is a great supporter of appraisers. He was invited to speak at the Appraisal Institute’s Residential Symposium coming up on January 26th in Downey CA to discuss Artificial Intelligence and Appraising. Here’s a link to their web site: http://www.bradfordsoftware.com. The other software option is ACI. Hi Craig, helpful post! I use all three but just ordered “homeputer” appraisal software from http://www.homeputer.com after reading links sent to me by AB; and their online reviews and samples. I HATE change as well and agree re analysis of each system you’ve used and subjective preferences. My decision was based purely on the announcement that corelogic bought out alamode and my previous knowledge that First American bought out ACI. Admittedly a spur of the moment final decision but one that had been in the offing for some time now. That the entire package costs only $249 and includes the first years maintenance and service made it a no brainer. Bradford, alamode and ACI cant [won’t] even try to compete with that price. Sometimes a person just has to bite the bullet and stand up for principles. I am NOT going to use either software service that is trying to put appraisers out of business. Especially the one that admitted they used millions of appraisals in the past without appraisers consent to help develop the software that they intend to try to see us replaced with! A little birdie told me recently that Alamode is auto subscribing all users into the SmartExchange program. Demand to opt out of that. So let’s count how many major distribution portals they have gobbled up, that’s all of them or nearly all. Gosh Id hate to think they are just assuming it is ok to just sign people up for things they didn’t ask for. You dont think they’d actually violate someones personal privacy do you? I just emailed this to AB but dont want to wait for it to possibly post. Remine is a powerful software platform that combines property records, data visualization, tracking, and predictive analytics. It combs over billions of data points to present users with a map chockful of information on properties. Remine is unlike any other real estate technology product on the market. And it’s coming soon to CRMLS. Most Remine services, including searching and mapping, will be available to all CRMLS users at no extra charge. Advanced options, like the ability to buy personal contact information of property holders or track a high volume of properties, will be available through fee-based plans. Want to learn more? CRMLS is offering a free webinars. Am I crazy? I mean more than usual? Am I the only person that sees the sale of property owner personal contact information to be an egregious violation of business ethics, and quite possibly federal privacy laws? MLS forms have had a provision for owner contact information to be displayed for other agents to contact them all along IF THE PROPERTY OWNER wanted it disclosed! So I have to wonder, where is this coming from? Perhaps the CORE clue is in the names ‘Core’ and ‘Remine’ (as in data mined). I’m pretty certain my local combined regional MLS doesn’t have the ability to scan data to devleop this information. I wonder WHO could it be that does? What sources would they likely use for this personal private information about property owners that they intend to sell? Could it be the owner of Realist? Did someone scan all the databases of the federal do not call list for this information? Is it possible that someone had access to uploaded loan-package data and appraisals through a ‘portal’ of some type with all kinds of personal ownership information in them? As for this super nifty ‘new’ analytics program how woud it determine market value for property that hasn’t reently sold…say a property that had only been recently refinanced? Perhaps some kind of ‘data aggregator‘? I wonder if it could be someone with a case pending before the FTC already? I guess we wont know until we see who is cashing the checks or processing the payments for that private contact information, will we? I know I’d be real upset to learn that ANY data contained in the FHA appraisal I pad for on my property found its way into some ‘data aggragator’ database for subsequent resale. As a homeowner Id consider that outright theft of professional services that I paid for. Theft for uses that were never disclosed to me. Do they also sell my social security and bank account numbers? Perhaps the names, gender and ages of my minor children? Have my tax records and tax return data now become public records though an aggregator that sells private information? BTW what exactly IS “data visualization”? Is that what we used to call ‘reading’? Corelogic Realist allows me and anyone else with access, to look at mortgage loan history, and identify which company sold the person their last loan, their track history of refinance, etc. So now I get all these clever mock mailers enticing me to buy mortgage insurance and other items with little disclaimers not actually associated with (my lender). FYI; if you are employed as staff appraiser with CoreLogic or were previously employed as staff appraiser (myself included), yes, there is a class-action lawsuit against CoreLogic for not paying proper compensation for overtime. Representation is by the same law firm that won against Bank of America for a similar complaint. Also if you’re facing layoff as a staff appraiser by CoreLogic, make sure you don’t sign away your rights to be part of the lawsuit in your severance package. You can find out more at this web site. Bryan Schwartz Law is presently investigating whether Assurant improperly denies its residential staff appraisers overtime pay for hours worked in-excess-of forty per week. If you have information regarding this potentially unlawful practice, or if you have any information or questions about this matter, please feel free to contact Bryan Schwartz Law. Our phone number is (510) 444-9300, or you may email rachel@bryanschwartzlaw.com. Good luck you guys! Go for it. I only wish they could take on I/C fee appraisers less than C&R payments, but I understand why they don’t. Too many jurisdictions and too many divergent policies on ICs. Yet another reason why individual state appraisal regulation does not work. I didn’t have a choice, they bought the company I was working for, LandSafe. With one in college, mortgage payment, and other life choices, I couldn’t quit because I disagree with the company I work for. Possibly others are in that situation as well. It took me about a year after their acquisition to come up with Plan B before I could leave.